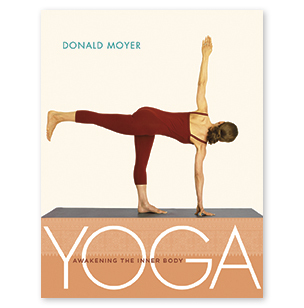 Donald Moyer describes his years of study with B. K. S. Iyengar (author of Light on Yoga); defines the inner body and various stages of awakening; and gives suggestions for practicing with this book. How to practice Salamba Sarvangasana (Shoulderstand) and Salamba Sirsasana (Headstand) safely and effectively. Do you have sloping shoulders or square-set shoulders? Is the curve of your neck normal, overarched, or flat? Depending on your body type, you may need to adjust the way you practice inverted poses. Chapters 1 and 2: Salamba Sarvangasana and Salamba Sirsasana present a detailed approach to practicing these important inverted asana, including variations and alternatives, how to use props, and how to check your alignment once you are in the pose. This part features six chapters, each with a practice sequence. Each sequence begins with an anatomical introduction and a movement theme. The movement theme is carried through a variety of poses: standing poses, backbends, twists, inverted poses, and forward bends. Each sequence ends with a breathing practice (pranayama) and a relaxation pose. Chapter 3: The Three Diaphragms. How to harmonize the action of the three diaphragms (pelvic, respiratory, and thoracic) to facilitate movement, improve breathing, and create a natural bridge between the anatomical body and the physiological body. Chapter 4: Balance Your Sternum. The key to opening your chest and releasing your thoracic spine is understanding how to align and adjust the three components of your sternum: the manubrium (upper sternum), the sternal body (midsternum), and the xiphoid process (the knobby protruberance at the base of the sternum). Chapter 5: Collarbones, Kidneys, and Groins. Exploring the subtle relationship of the collarbones, kidneys, and groins, we discover an effortless way to stabilize the pelvis, open the shoulders, and lengthen the spine. Focusing on the kidneys, we align our internal organs with our outer body to create freedom of movement in backbends, forward bends, and twists. Chapter 6: Align Your Shoulder Blades. Whether you raise your arms out to the sides, lift them overhead, or extend them behind your back, let your shoulder blades follow and adjust to the contours of your ribcage. Work with a circular movement of your shoulder blades to create space in your shoulder joints. Chapter 7: Stabilize Your Elbows. Learn how to strengthen your arms by stabilizing your elbow joints. If you have a significant carrying angle (more prominent in women), if you tend to hyperextend your elbows, or if the muscles at the back of your upper arms (the triceps) feel weak, this chapter is intended primarily for you-but everyone should find it helpful. Chapter 8: Strengthen the Base of Your Neck. If you experience tightness or discomfort in your neck, this sequence will have a therapeutic effect. Learn how to adjust the spines of your upper spine to restore and maintain the natural curve of your neck or reduce a dowager’s hump. Activate the deeper muscles of your neck (the splenius muscles) to support the weight of your head and make your neck strong and resilient. Paper ISBN 978-1-930485-12-9 • E-book |SBN 1-930485-74-7 • $23.95 • 256 pages • 8.5" x 11" • 162 color photographs by David Martinez • 31 color illustrations by Krista McCurdy • book design by Gopa & Ted2, Inc.